I've been meaning to get this review up for weeks but between trying to get caught up on work after all the time I lost after the hurricane and Thanksgiving last week, I just didn't get around to it. 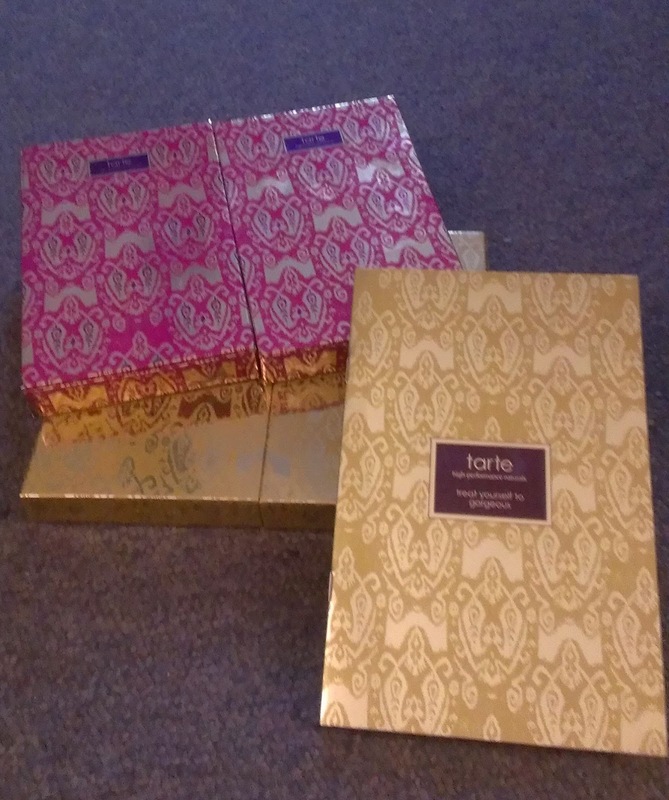 Well, better late than never because you can purchase the Tarte Treat Yourself to Gorgeous TSV from QVC starting at midnight tonight (or tomorrow, technically). The kit contains three separate boxes - one that contains four full-size Cashmere Waterproof Gliding Liners; one that contains four full-size Maracuja Divine Shine Lip Glosses; and one that contains 20 full-size Amazonian Clay Infused Shadows. The boxes are magnetic so they all stick together, which is kind of neat. 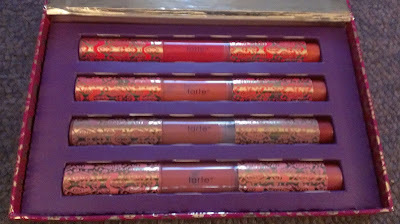 Now, I decided to buy this kit instead of the Tarte Carried Away Collector's Set from Sephora because it was a little cheaper, it contained all full size products, and I honestly thought that I would break it up into a couple of gifts. 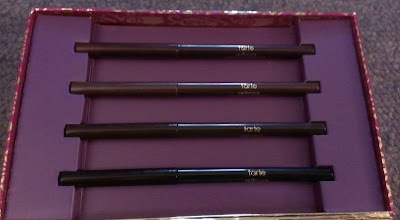 I planned to give the eyeliners to my sister, the glosses to a friend and keep the shadows for myself. Then the kit arrived and I decided to just be selfish. The four liner shades in the kit are black, black brown, bronze and black orchid. I'm a big fan of the Cashmere Waterproof Gliding Liner formula - super creamy and easy to apply - and think the colors here are good ones. 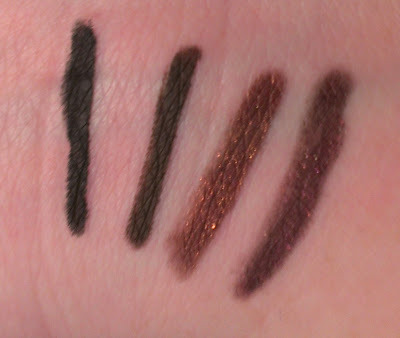 Who doesn't need a good black and dark brown liner? The black orchid shade is lovely too, but with my blue eyes, I just can't get enough of the bronze. FYI - the black and black brown liners are "matte," while the bronze and black orchid have a pretty metallic finish. 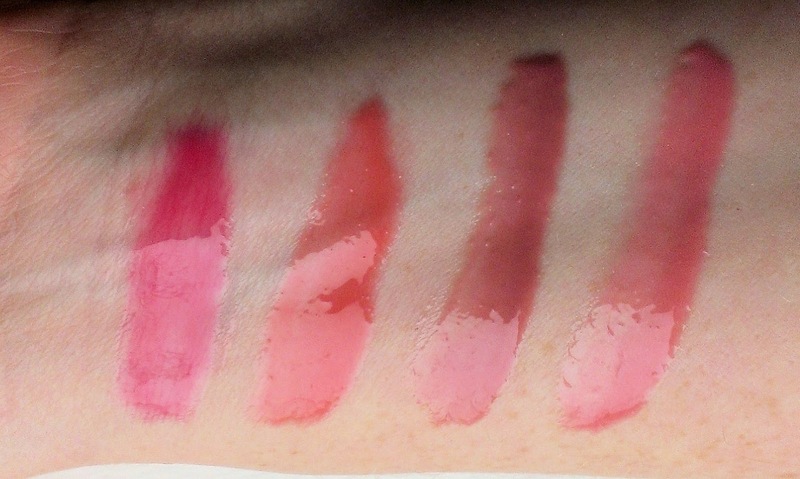 The four glosses in the kit are Darling, a light pink; Brazen, a bright pink; Giddy, a bright coral; and Genuine, a soft mauve. I like the formula of the Maracuja Divine Shine Lip Glosses quite a bit - they're not too sticky but they still have decent staying power - but I will go on record saying I hate the applicators - that annoying click pen style. I swear I had to press them each about 30 times before any product came out. The shades are nice too - a nice assortment to go with a variety of looks. 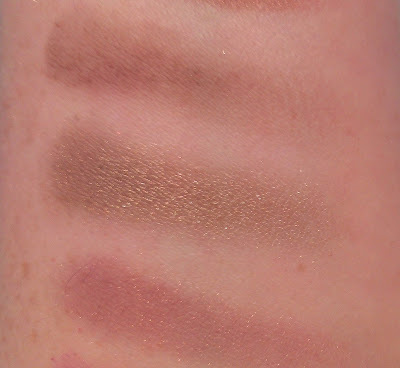 Now, they are 20 eye shadows in the kit - I couldn't bring myself to swatch all of them so I selected a few random ones to give you a sense of the pigmentation. 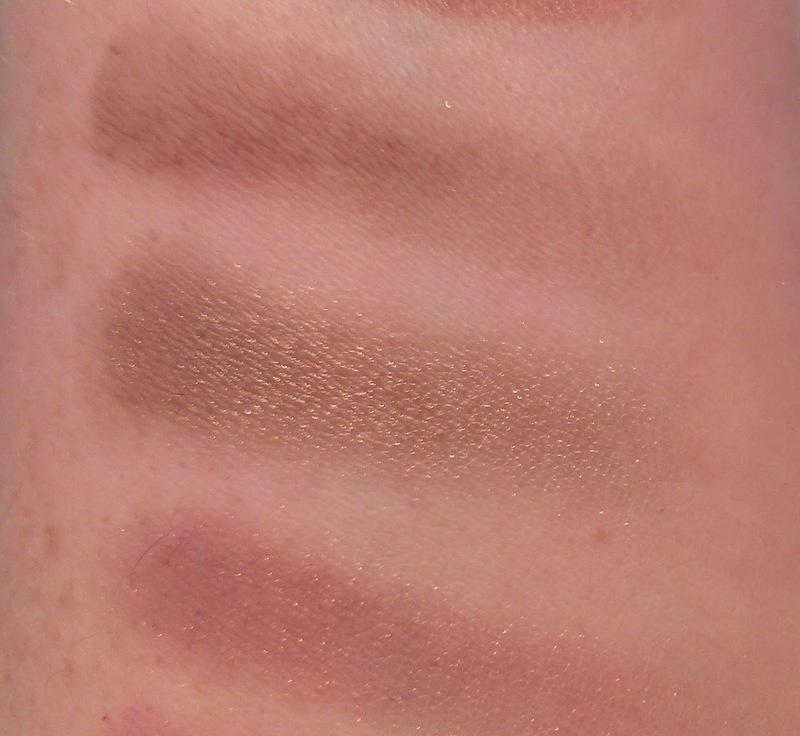 With the exception of a few sheer shades, these shadows are nicely pigmented, smooth and easy to blend. 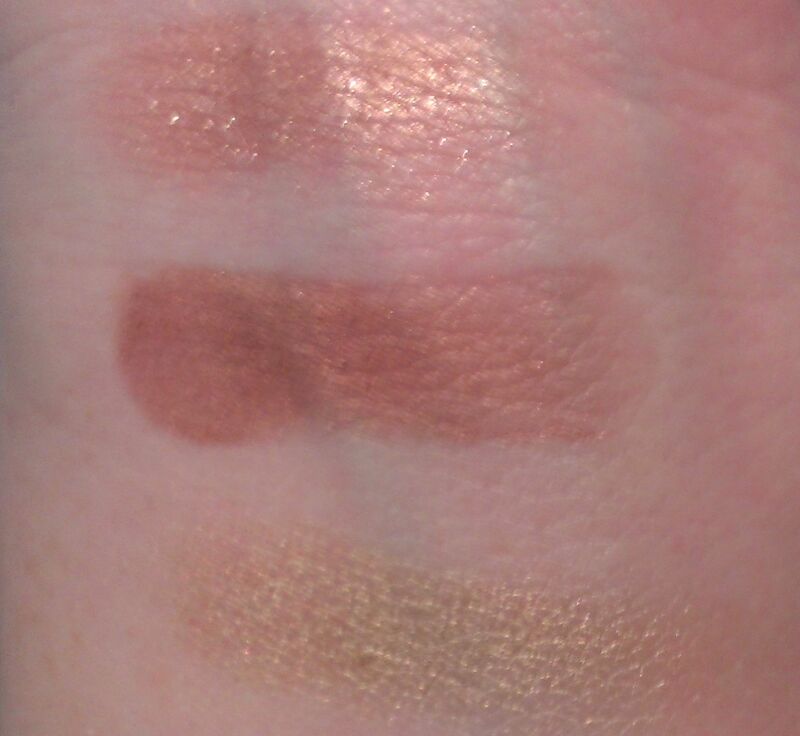 There are four matte shades and the other 16 are shimmery. A few have glitter in them, though it's not particularly chunky. 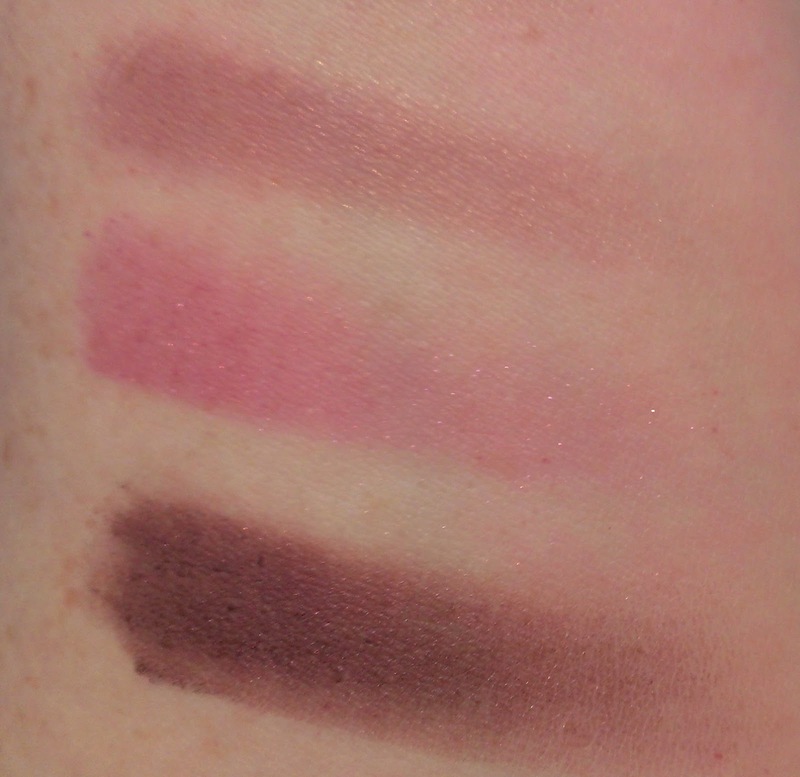 For the most part, the shades in the kit are soft and muted. There's a pretty bright purple shadow, Gossip, and a few deep, dark shades, but the rest are ideal for more natural looks. The kit costs $49.98 (+ s/h), but you can also get it for three Easy Payments of $16.66. 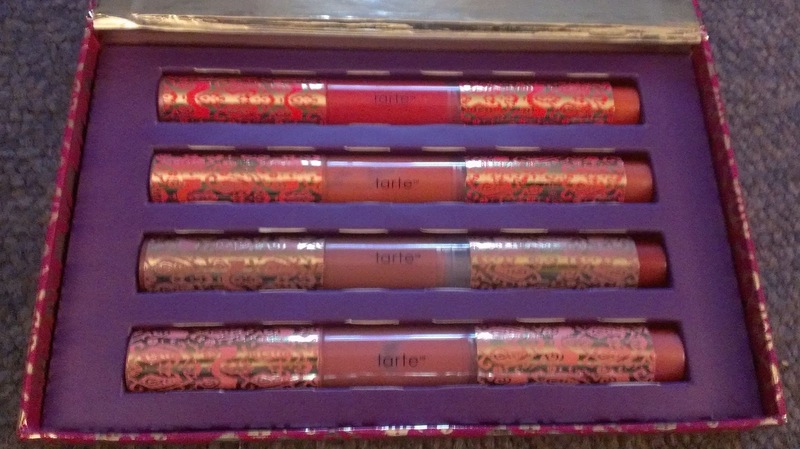 That's a serious bargain considering that the four full size glosses would cost $84 all by themselves. 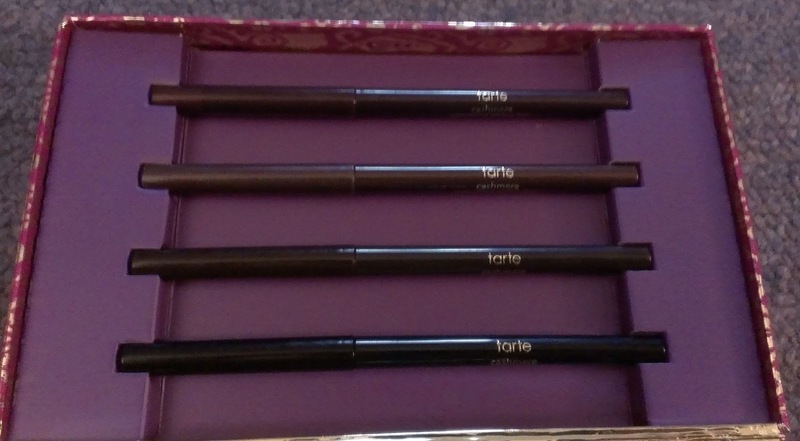 I really think that this makes a great gift for any makeup lover on your shopping list. 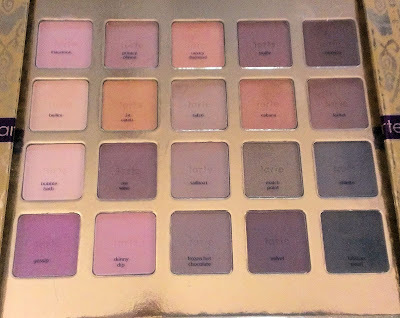 Since the colors are soft and mostly neutral, they can work for pretty much anyone - you could buy it for your 15 year old sister and your 75 year old grandmother, I think. And - though this probably goes without saying - it also makes a great gift for yourself. Are you going to take advantage of the Tarte Treat Yourself to Gorgeous TSV? Are you planning to keep it for yourself or gift it? Have you had any problems with the cashmere liners drying out? My original black one from a TSV is really hard to work with now. It isn't nearly as creamy as it used to be. Now that you mention it, when I compare my first Cashmere liner to these new ones, it's not as creamy so it does appear to have dried out a bit. But it's still pretty easy to apply and smudge. I had an issue with one of the BE Round the Clock liners completely drying out after only a month or two, though the rest have all been fine. The only liners that I can say really say are as creamy as the day I got them are the UD 24/7 pencils. Those are definitely my favorites. Thanks for the response. I'm glad to know it wasn't just mine. That stinks about the BE liners!